Paitoon Jaengchuen, 63, was arrested for impersonating a navy admiral and allegedly running a fake charity scam. 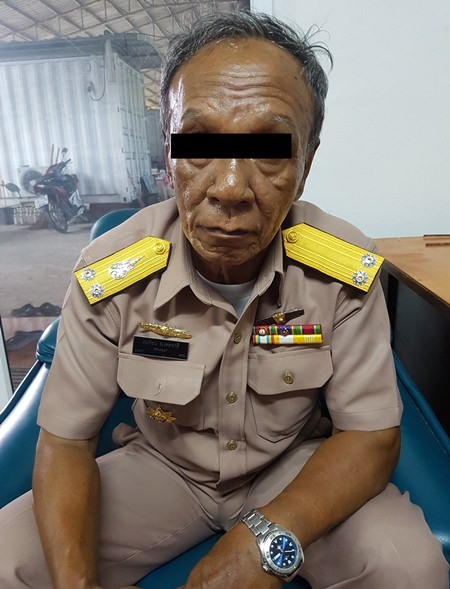 PATTAYA – A man impersonating a navy admiral was arrested for allegedly running a fake charity scam. Paitoon Jaengchuen, 63, was taken into custody by Sattahip and Royal Thai Navy police Aug. 21. They confiscated a navy uniform, a number of badges and stripes, charity donation boxes and envelopes, and 1,270 baht in cash. The arrest came after reports a navy rear admiral was soliciting funds for an unknown charity. While investigating, authorities discovered Paitoon was wearing odd and inappropriate badges and they arrested him. He was charged with impersonating a naval officer and fraud. The Samut Prakan native did not want to give his full name and bank account records and other documents found on him did not match. Paitoon claimed the identification card found on him belonged to his brother. Authorities are continuing their investigation.